A key to finally getting federal law changed so immigrants can more easily work on Vermont’s dairy farms is getting farmers and farm advocates here to reach out to their counterparts in Republican-leaning states. That is the analysis of people familiar with the legislative process in Washington, D.C., commenting on the future of the Agricultural Worker Program Act of 2017, bill S.1034 in the U.S. Senate and an identical bill, H.R.2690, in the U.S. House. In early May, Leahy partnered with California senators Diane Feinstein and Kamala Harris, Colorado Sen. Michael Bennet and Hawaii Sen. Mazie Hirono to introduce the Senate bill. Rep. Peter Welch, D-Vt., co-sponsored the identical House bill on May 25. The proposed legislation is the latest in a series of efforts to address the labor needs of farms in Vermont and nationwide. 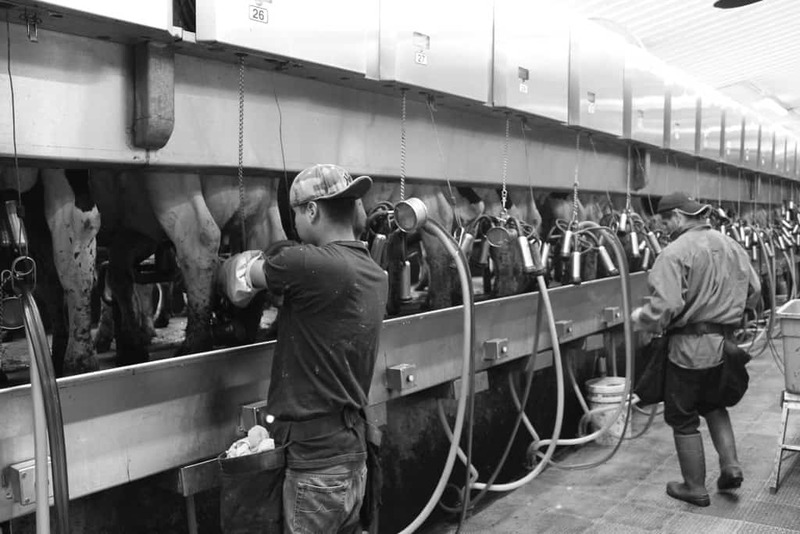 Migrant labor, mostly from Mexico and mostly undocumented, has formed the backbone of the Vermont dairy workforce for the past 10 to 15 years. Current immigration law does not allow foreign-born workers to stay over an extended period, but dairy farmers in particular need help on the farm every day. The impact of losing this workforce could be devastating to the state’s dairy industry, ag experts say. Instead, said Carle, immigration issues have languished in a “toxic environment.” “Just the topic of immigration has become somewhat of a so-called third rail on Capitol Hill, where it’s so difficult that it’s hardly ever attempted,” he said. Leahy’s Vermont-based ag expert, Tom Berry, also emphasized the sharply focused nature of S.1034. As introduced, the bill’s sponsors are all Democrats. Close to two months later, the roster of cosponsors still lacks “R” legislators. In the Senate, the bill has gained three new cosponsors: Kirsten Gillibrand (N.Y.), Tom Udall (N.M.) and Al Franken (Minn.). In the House the legislation now has 42 cosponsors (from an initial 26), but all are still Democrats. Berry also emphasized the importance of those in Vermont’s ag sector, especially, to reach across state lines. “Part of the larger strategy on this legislation is to get the bill introduced and to expose it to farm groups,” Berry said, noting that “Vermont is often looked to as a leader” on ag issues. Carle observed that 2017 is already a year in which Congress is moving farm issues “to the front burner” as it takes on the work of crafting a new farm bill (the 2014 Farm Bill will expire in September 2018). “It’s easier to get people to focus on things like this when a farm bill’s in the offing,” he said. While foreign-born workers provide much of the labor on Vermont dairy farms, their ability to stay in the country legally is hampered by U.S. immigration law.